If one book is a world in itself, then book upon book upon book offers so many avenues of discovery that it can be almost paralyzing if it wasn’t so exciting. This year I had only three hours at the Codex International Book Fair in mid-February. Rather than agonize over everything I wasn’t able to see, I let myself drift down the aisles and be led by my intuition and visual cues to what would interest and inspire me. I always come out of this event in a state of deep exhilaration and exhaustion, but managed to gather some images and impressions to bring home with me. 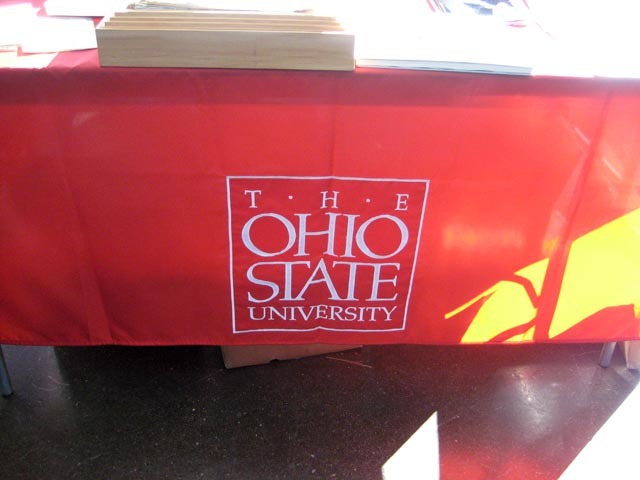 The hand with the dancing letters shown above was my reward for answering this visual cue, literally a red flag, with the westering afternoon sun shining through the words “The Ohio State University.” Since this university was my father’s alma mater and he attended when I was in primary school, I headed over to investigate this presence from my past. There I met the voluble and knowledgeable book arts specialist Robert Tauber, who was full of fascinating information. 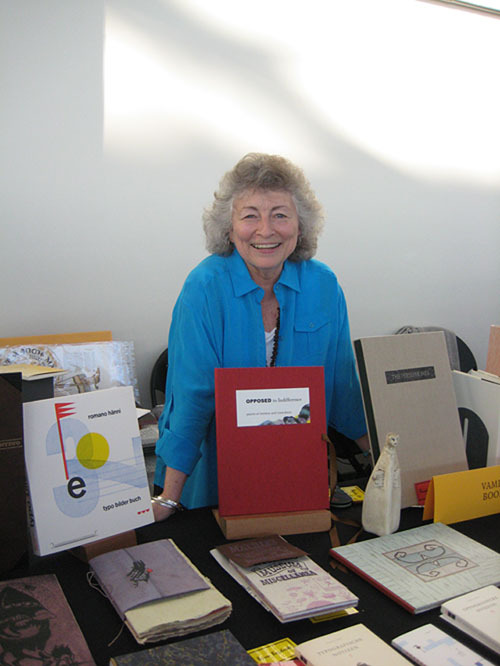 This particular book, showcased front and center in a wooden case, and titled Epodes: First Poems, was made for an essay Cynthia Ozick wrote about why she would not write poetry anymore, along with poems she did write, published by OSU’s Logan Elm Press. But the letters, illuminated and dancing out of the fingertips of the hand window in the paper were just truly breathtaking. 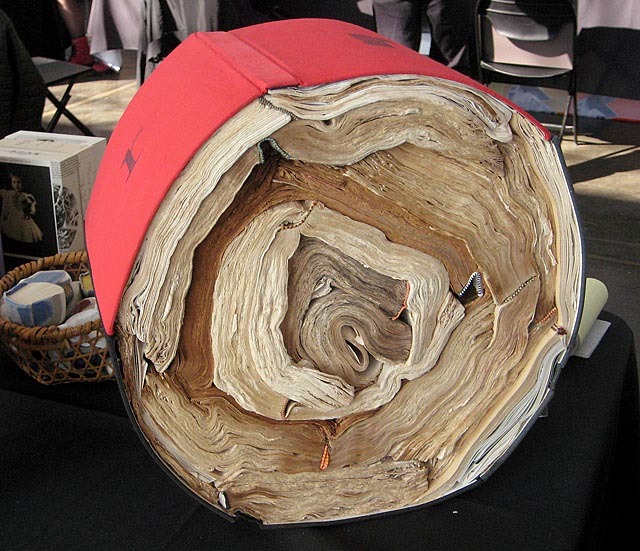 Below is another picture of it in its wooden case: very large pages: the hand is life-sized. On first walking into the pavilion, I had the uncanny experience of “falling into” an intimate book of poems by Alan Loney. The words, about making poetry and books, the typography and the hand painted watercolor highlights on facing pages all made this a book to linger over. I forgot to ask the name – isn’t that sometimes the way when you meet something or someone you fall in love with? – and didn’t get a photo, but still remember how it felt, the magic of words made of letters and colors. Alan Loney is bringing the Codex Fair to Australia, and his published trade book The Books to Come, is a thought-provoking meander through bookness. His website for Electio Editions is well worth a visit. It was here I found this musing printed on one of his broadsides: “Haunted by a book you’ve read, something of it returns repeatedly to memory, haunted by one you’ve written, something of it returns again and again to writing.” This I have found to be true, as I return often to ideas and themes I’ve treated before, only to find some thing newly interesting about them. postscript: I have discovered the name of this book from Alan Loney that I saw that day: Zephyros : the book untitled which as it turns out is, content-wise, the third chapter in The Books to Come, which is why that chapter seemed so familiar. But the unique book made from these poems is typographically much more interesting, and has had beautiful acrylic ink gestural paintings added to facing pages by Miriam Morris. This tree stump book stopped me in my tracks as I paused to admire the artistry and physical challenge of constructing such an object out of old books with yellowing pages and intact headbands, should there be any doubt that this was indeed a book made from a tree and then made back into a tree. Made by Jacqueline Rush Lee. 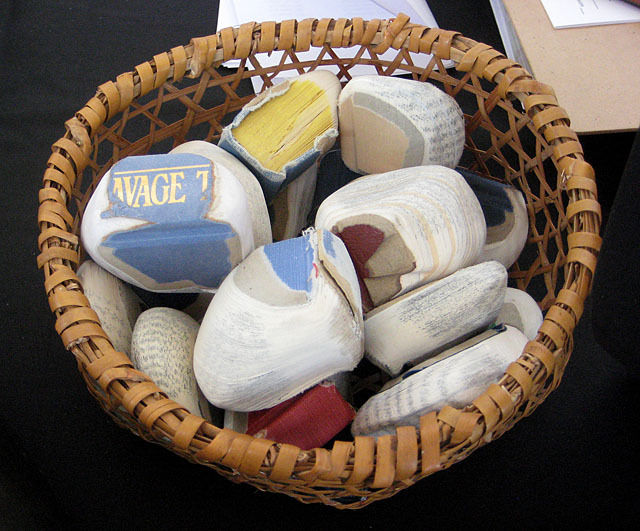 Next to it was a basket full of book stones, Pamela Paulsrud‘s shaped and shaved “touchstones.” When closed they resembled stones with beautiful striations made of the letters on the page; with a little bit of spine left intact the stone’s pages may still be opened. I think I did touch them all, and wanted to bring home the whole basketful to add to my existing stone collection. These books as tree and stone were at the Seager Gray Gallery table. The beautiful work of Marina Soria was my next treasure to linger over. I love her connection of letters with the stitches of sewing. 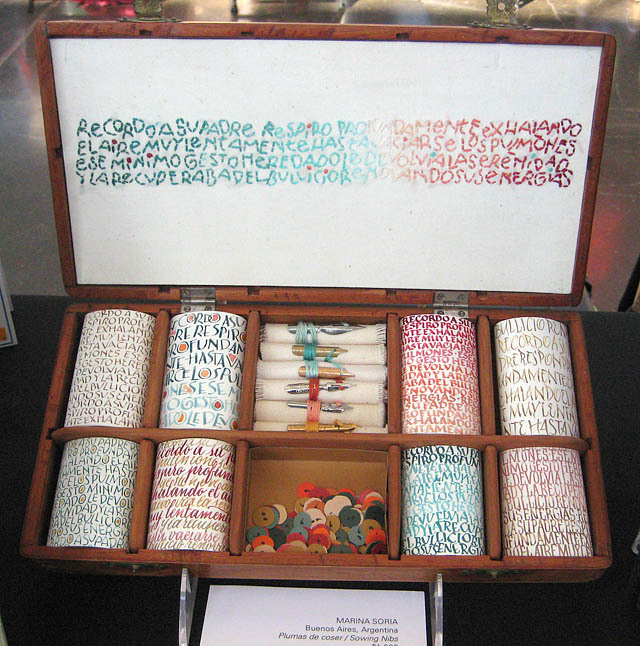 My early creative work was in textiles, and the nibs sewn onto the fabrics, the rolls of text arranged like spools of thread in a sewing box seem just right to me. Looking for ways to bring calligraphy as an art to her country led this Argentinian artist to combine letter art with fiber art. Brilliant. Thanks to Laura Russell at 23 Sandy Gallery for bringing the work of this fine artist to the fair. At San Francisco Center for the Book‘s table (I think) was another book using fabric, with closely set writing on a series of canvas pages, edge to edge, like I used to keep journals in college. An avalanche, a torrent, of words. This book is actually a form of meditation, for as the artist Aimee Lee explains in her artist’s statement about this book: “For my whole life, I have been a voracious reader. However, in the urgency of my reading process, I often read too quickly and miss important content. The best way I know to slow down my reading is to transcribe it with pen in hand so that my hand gives shape to what my eye perceives. This is particularly apt for quieter and meditative text, and I find that the experience of reading through the eye and reading through the hand provide two completely different interpretations. 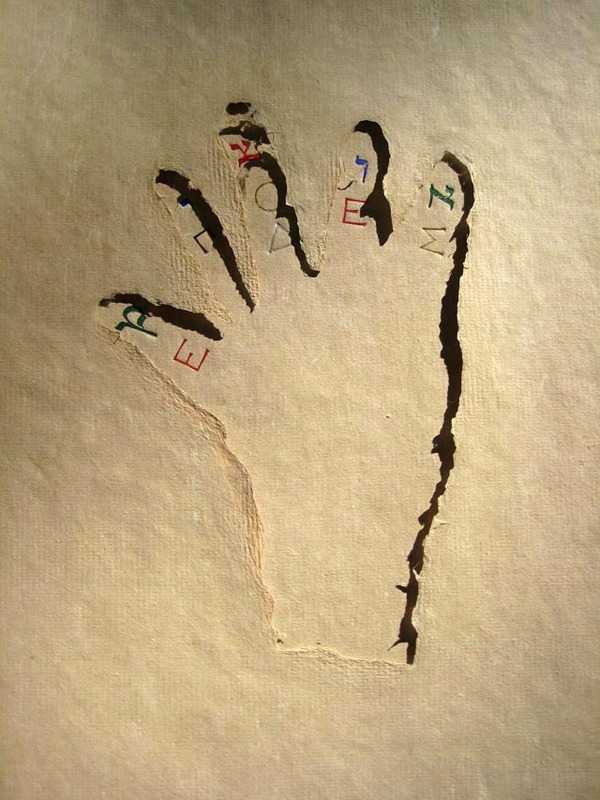 The former leaves traces only on the body, while the latter provides a new document, fully digested and consumed.” Reading through the hand. The sacred work of the scribe. 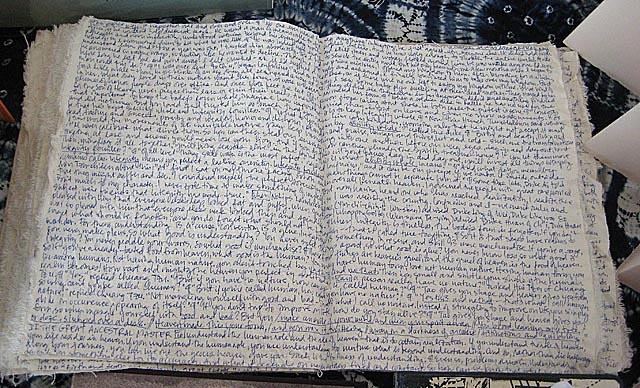 And, the feel of the fabric under the hand, while writing. This arresting book cover is the work of Daniel Essig, and was displayed at eye level on Vamp and Tramp‘s table. 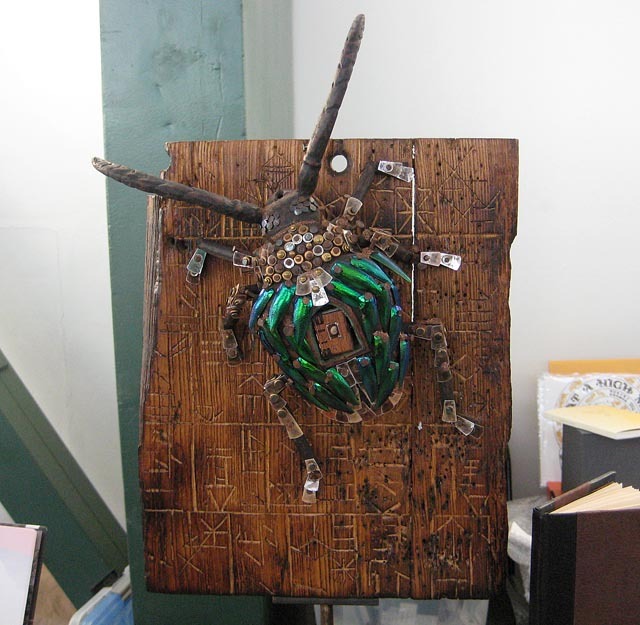 His sculptural books are legendary and it was a treat to see this one with its runic inscriptions and magnificent glowing beetle made of mica and other odd bits. I had a nice visit with Vicky Stewart, the Vamp half of the duo while Bill was showing books to a real customer. I’ve learned a lot about the book business from these folks who traipse around the country in a hollowed out van with cases of books, showing them to collectors at universities and institutions across the United States. Bless their work! And all the folk who collect and help to show the work of so many book artists across the world. Then I lifted my eyes to some splendid illumination and lettering. 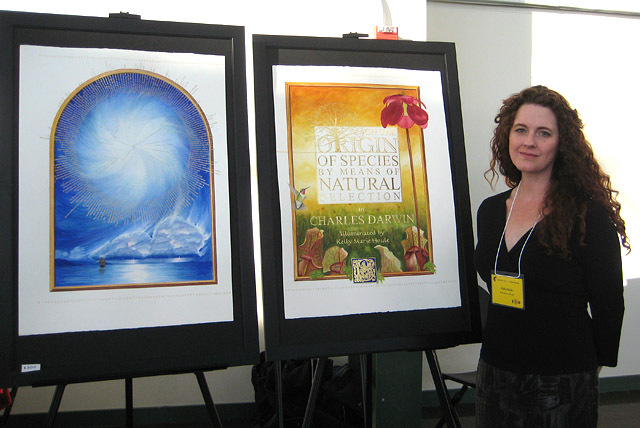 Shown here with their artist, Kelly M. Houle, these two pages form the frontispiece and title pages of her current project, a traditionally illuminated book of Charles Darwin’s iconic The Origin of the Species. 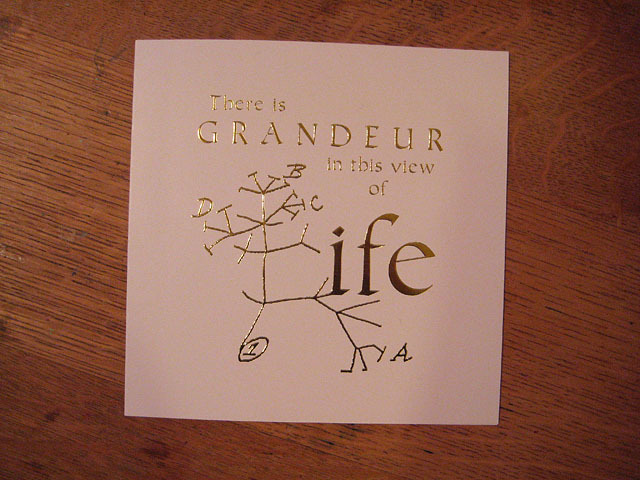 The paradoxical combination came about in 2008 when, during the worldwide recognition of Charles Darwin’s 200th birthday, Kelly also saw an exhibit of The Saint John’s Bible. Her press, Books of Kell’s, has produced small editions (more beetles are here!) and now embarks on this monumental project. Kelly, a science educator and botanical illustrator with the heart of an artist, is bringing all of her skill sets together to produce an Illuminated Origin. Well worth a look. This year the fair was moved to the Craneway Pavilion in Richmond, California, a spacious and beautiful converted car factory on the waterfront of the San Francisco Bay. Though I only dipped my toe into these four days filled with 185 exhibitors, my head is still spinning, two weeks later, with all that I learned. I am in awe of the great diversity and creativity informing the book arts world and am glad that we still flourish, bringing these old arts into the twenty-first century. Share if you like . . .
Hello and thanks, Cari, for this reportage on something I have longed to attend for some time! I have two degrees from your father’s alma mater, Ohio State (with a year at Syracuse U. in between), so was very interested in the item you show. Am impressed with your photography! Nice job. Thank you for your generous report and for your appreciation of the Logan Elm “Epodes.” I wish the wonderful full page pulp paper illustrations by Sid Chafetz. could be seen. It is truly an extraordinary book. From a Logan Elm Press collector. Thank you for writing, Marcia, and for catching my error in the title. Not Episodes but Epodes, yes, of course, a lyrical term for this book about and of poetry. 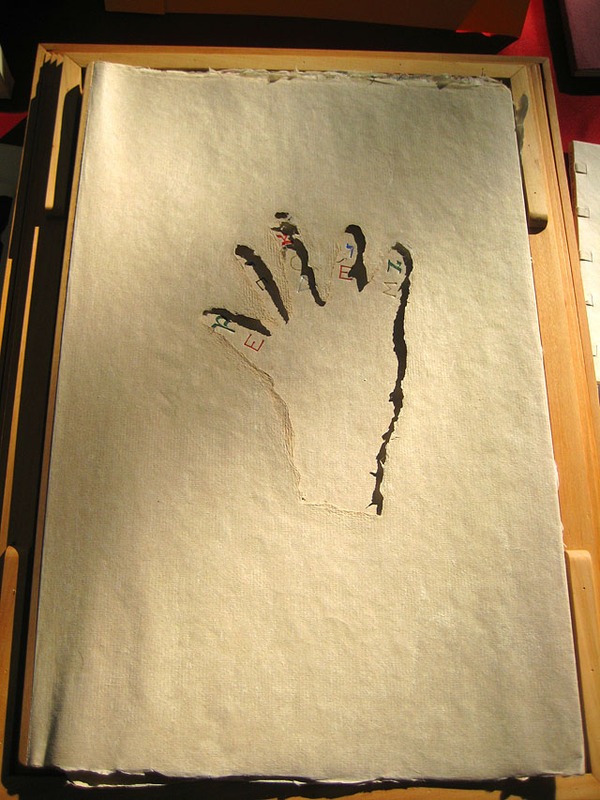 I was told that the cover paper with the “hand window” was made by making a rubber-type mask of the hand shape and placing it on the mold before dipping it into the pulp, and thus making a deckle on the inner AND outer edges of this paper. The illustrations inside the book were indeed extraordinary. Cari, what a wonderful review of Codex. It makes my heart so happy to read reviews like yours where the books, and elements thereof, transport the viewer to such an experiential place. Each and every table was filled with wonder. It truly takes four days to breathe it all in.